Mars will reveal the sixth M&M's character, Ms. Brown, in the M&M's Super Bowl 2012 Ad. 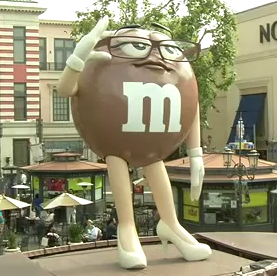 Ahead of the big game, Mars revealed a statue of Ms. Brown at a shopping mall hosted by actor Neil Patrick Harris. Like all of her fellow M&M's spokescandies, Ms. Brown has her own distinct personality, which is rooted in her wisdom, high intelligence and sharp wit. Her unmatched knowledge of milk chocolate vaulted her to the position of Chief Chocolate Officer - a position she's excelled in for seventy years, helping make M&M's one of the most popular chocolate candies in the world. Ms. Brown wears glasses and has rather long legs compared to her spokescandies colleges. I am still not quite sure how the M&M'S Super Bowl 2012 Ad will make a reveal of a new Spokescandy entertaining to watch. My guess is that Mars will bring out a celebrity in the M&M'S Super Bowl commercial. For now you can watch Neil Patrick Harris unveil Ms. Brown.